Gargoyles on the Quad | The Happy Wonderer ~ ellen b. 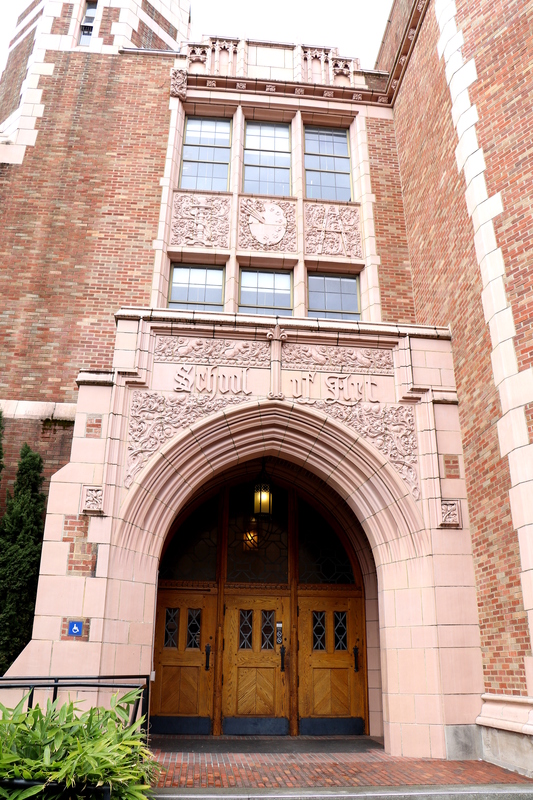 The University of Washington in Seattle was established in 1861. 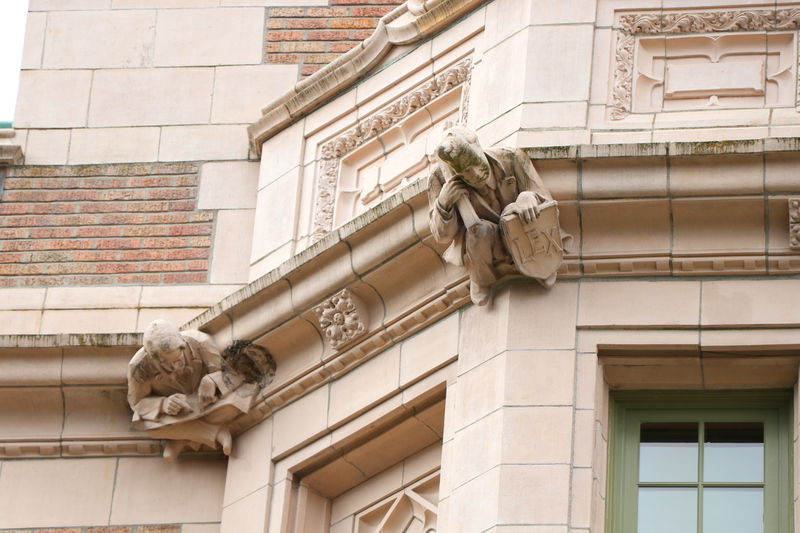 The gargoyles I zoomed in on are located on buildings in the Liberal Arts Quadrangle, commonly known as the Quad. 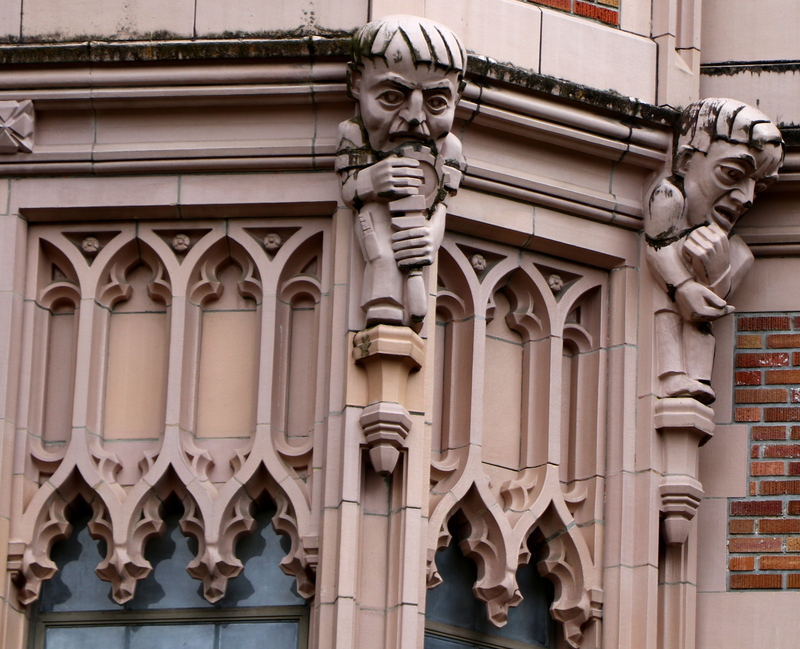 While we were admiring the Cherry blossoms and the Magnolia blossoms at the University of Washington I enjoyed zooming in to get a closer look at the gargoyles on the different buildings on the quad. 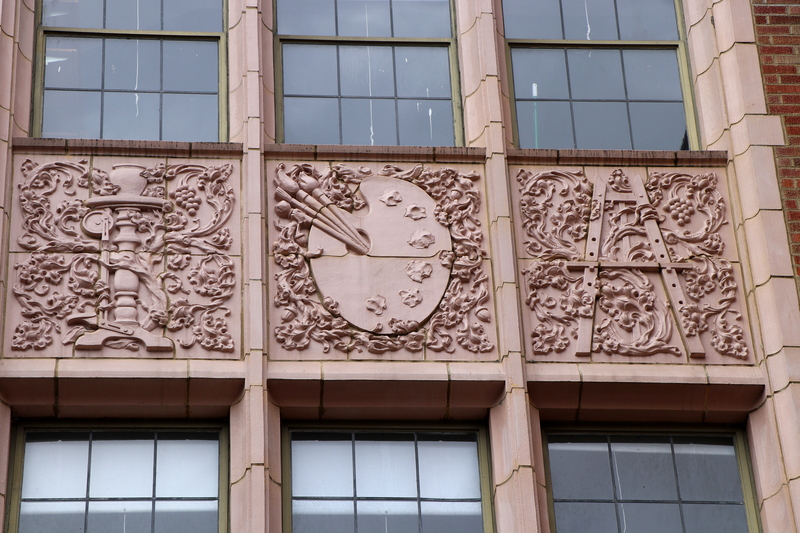 I also took some close ups of the School of Art and Music buildings. Gargoyles are figures often carved into the architecture of old churches, usually in the form of a grotesque animal or human. Many times gargoyles in Gothic churches were attached to the gutter system of the roof, with the mouth of the gargoyle acting as a spout for rainwater, helping keep the masonry from being destroyed. 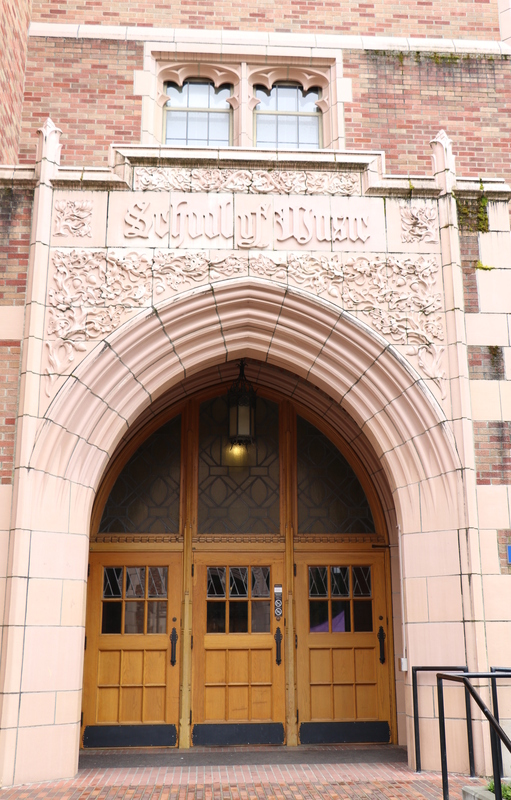 The University of Washington is a real treasure for the state and city of Seattle. We have two graduates of the University in our family and one more who will graduate in 2018. Enjoying lots of cuddle time with our new granddaughter. We had an exciting wind and thunderstorm event today. Haven’t had time to upload new photos but will soon. Saturday we are headed to a junk show. We have some items we are on the lookout for. I’ll let you know how it goes. Tomorrow is Palm Sunday and we enter Holy Week. I’m so glad Jesus came to earth to save us. Have a wonderful weekend. 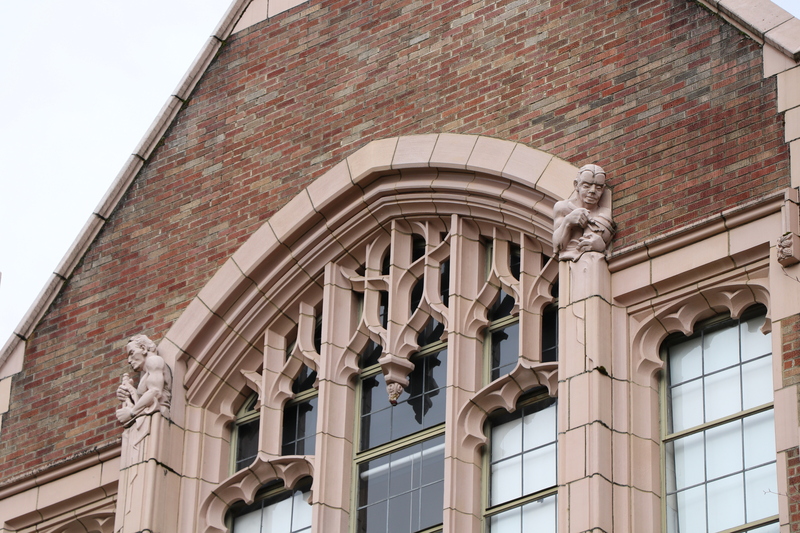 Posted on April 8, 2017 by Ellen •	This entry was posted in Architecture, Seattle and tagged Architecture at the University of Washington, Gargoyles, The Quad at the University of Washington, University of Washington. Bookmark the permalink. 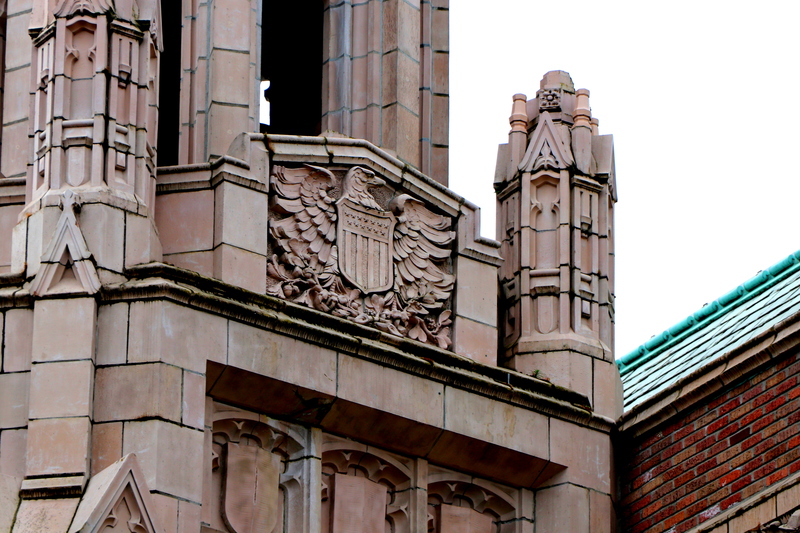 I love seeing the details of the architecture. Looking forward to new baby pics! …this was built during a time when attention was given to detail, not like now! 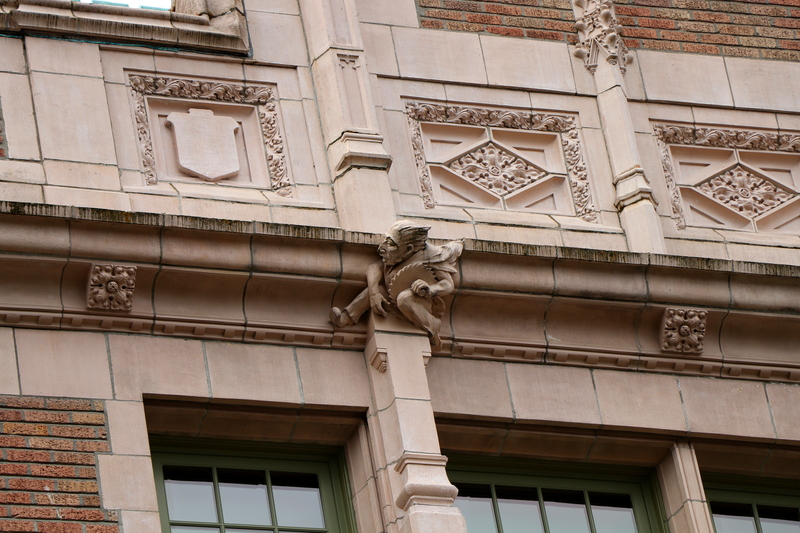 Those are some of the more interesting gargoyles I have seen. The Confederate officer surprised me. A happy time to you with your son and his family. I LOVE this stuff! Whenever I visit a new city, I try to get to the recommended areas of interesting architecture. You guys hit the jackpot with this! 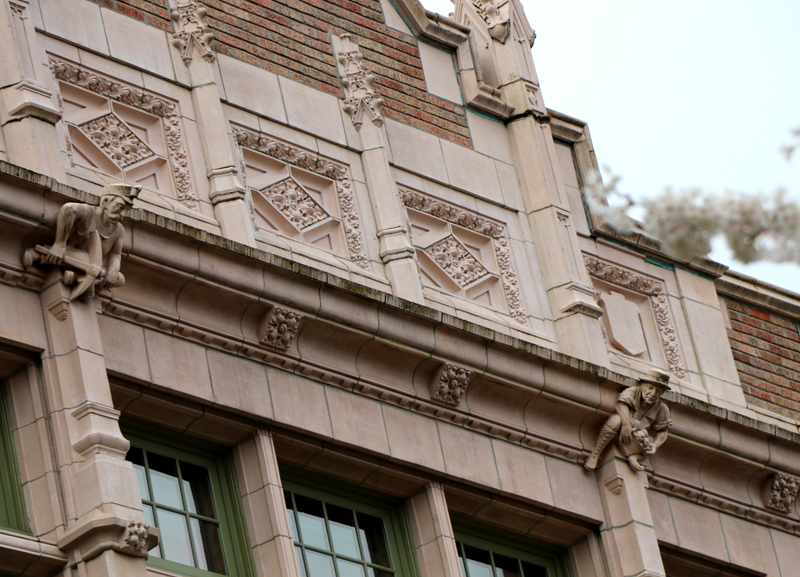 These buildings are marvellous with all those details and gargoyles! Great photos and glad you are able to enjoy being with little Addy! Those buildings are so cool. I used to live in Seattle and worked and moved all around the U of W, but I never actually walked on this part of the campus! Now I see what I was missing! Hello Ellen…your pictures from over the last few posts are gorgeous. The magnolia blossoms are so pretty…and I love all of the architecture that is so beautiful there at the University. 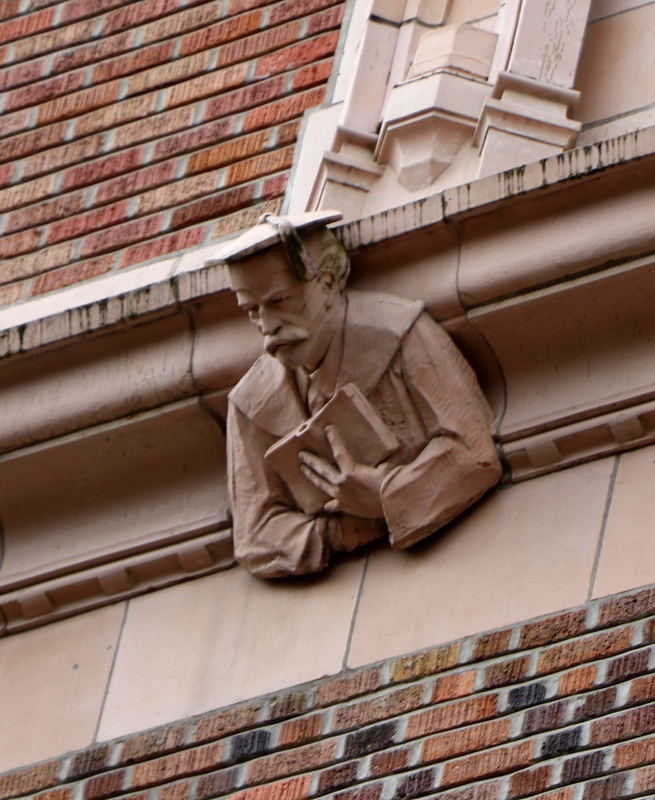 WVU has some very old and very nice architecture on its campus too…but nothing as outstanding as there in Seattle. The newer buildings that they have errected on campus here hold no compairson to the beautiful old buildings. I think they call it progress…I call it sad. And so you made it back over the mountains to see that sweet Addy! I hope that you have a wonderful time with her…and her parents. Hope you find some treasures today as you go to the junk show. May you have a blessed Palm Sunday tomorrow…and a precious time with the Lord during Holy Week. I find gargoyles so fascinating. You got some great shots. Enjoy your cuddles – I’ll bet she’s growing and changing a lot already! I’ve never seen gargoyles like these. Very interesting! Enjoy this time of baby cuddles! I wondered if you were ok in the PNW storm. I heard lots about it on facebook. Willow, Here in Eastern Washington there are more roads closed because of water over roadways, road damage (due to undermining from water flow) and power lines were down over a roadway. Hope you are enjoying all the baby cuddles! 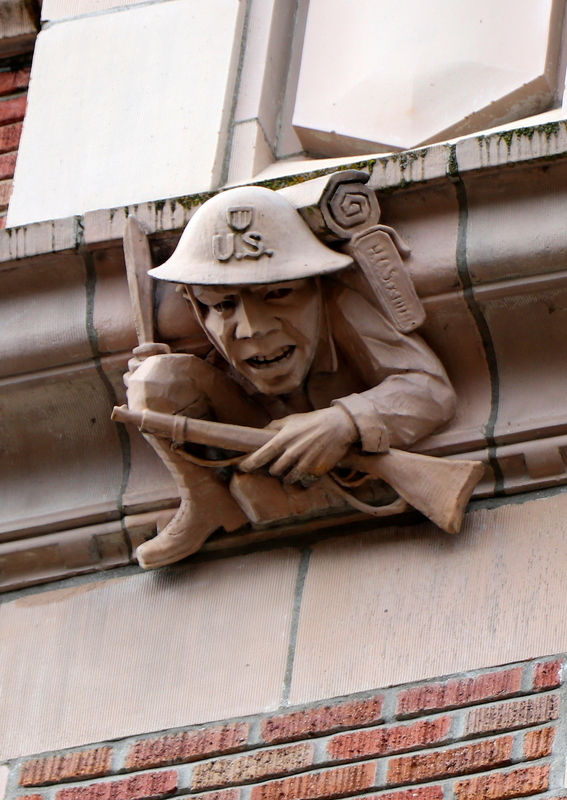 Great pictures of the gargoyles too, and interesting history behind them! Yes, we got that storm too, it was wild! Thankfully we didn’t have any damages. 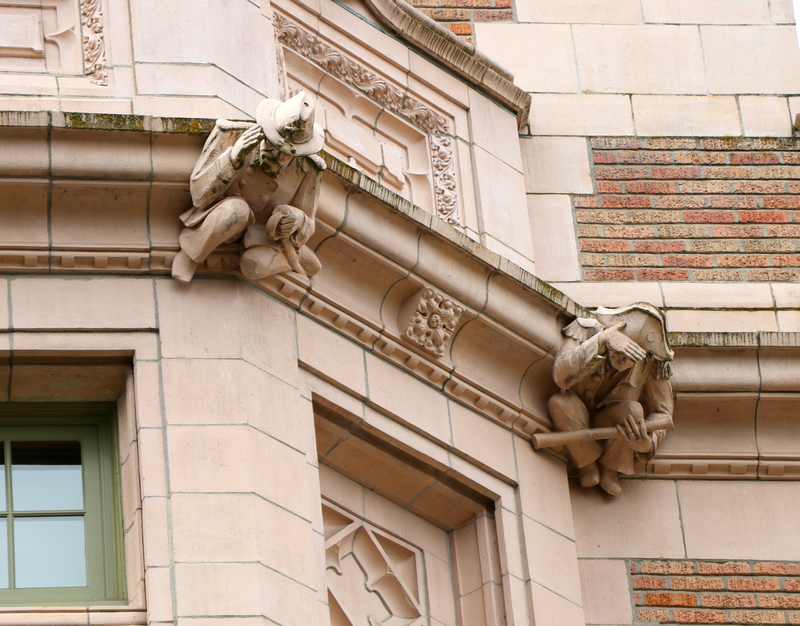 Pingback: University of Washington Gargoyles | The Happy Wonderer ~ ellen b.